Woolly worms, the eliminated selvages from Pendelton blankets, inherently impart visual and textural interest to a handwoven rug. The arrays of colors, color combinations, textures, various diameters and lengths aid me in creating movement, mood, and appeal in a simple plain weave rug. Another allure of these waste ends is the element of surprise. The worms are ordered by the pound, and no color choices can be made. You get what you get. Certainly over time I build a stash, but otherwise the limitation ultimately intensifies my creative process and stretches me in my artistic outlook. After receiving the woolly worms in the mail, I separate them into color and style piles for future use. Since I weave several rugs on the same cotton yarn warp, I create a warp using several of the predominant colors. 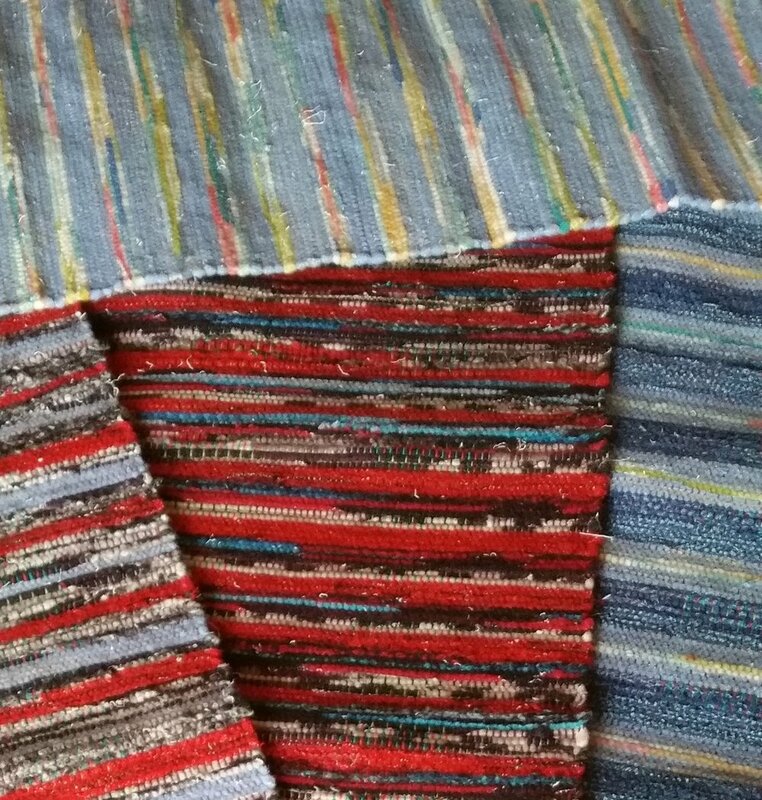 I typically add vibrant complementary colors to the warp as well, which brings additional visual interest to the rug. I then choose several colored bags and start playing to see what weaves up. The weight of the beater of my 18th century Pennsylvania German loom forces the worms into position, often folding them multiple times during the compression process. The random patterns of compression, plus the diversity of the worms, makes for a rug with great visual interest. The process just makes me smile.